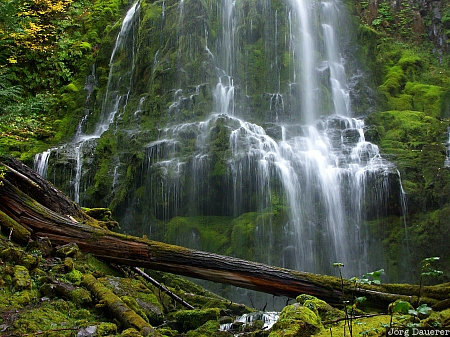 The waters of the Proxy Falls in the Cascade Range falling down onto moss covered stones in the Three Sisters Wilderness, Willamette National Forest, Lane County, Oregon, United States. This photo was taken on a sunny day in October of 2004. This photo is part of the exhibition Waterfalls (June 2009). This photo was taken with a digital camera.